I am now accepting pre-orders for the next run of Benjolin V3 and Butterfly Benjolin chaotic sound instruments. Pre-orders will be accepted up to 05 MARCH 2016 with a 50% deposit required. Projected delivery of this run will be mid-APRIL 2016. 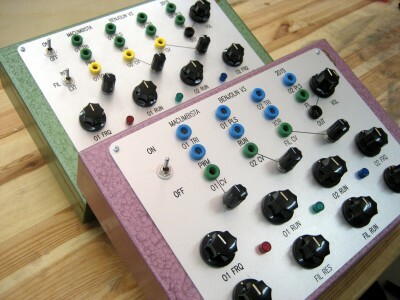 These hand-made Macumbista Benjolins are officially licensed by Hordijk, and have been further customized with a patchbay, which can be used to interface with other modular synthesizers or to setup further control voltage feedback systems within the Benjolin itself, attenuators on the three control voltage input and LEDs displaying the internal state of the Rungler. The double version, which I have named the Butterfly Benjolin, allows incredible amounts of chaotic cross-modulation between the two halves of the instrument. 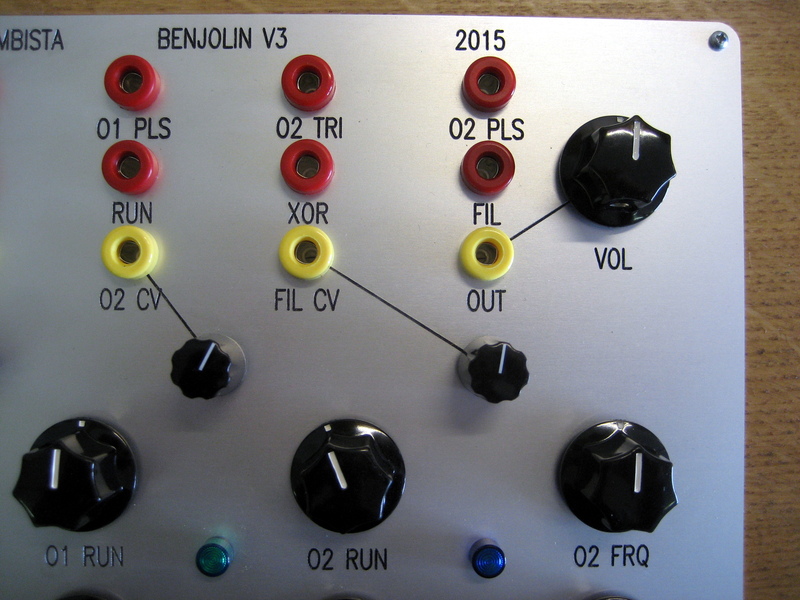 The price of the Benjolin V3 is EUR 495 (incl. 19% EU VAT) / EUR 416 (shipped outside the EU), and the price of the Butterfly Benjolin is EUR 895 (incl. 19% EU VAT) / EUR 752 (shipped outside the EU), plus shipping. Please contact me using the CONTACT page here, or through MACUMBISTA at-the-domain GMAIL dot COM. Current wooden box options for the Benjolin V3 are natural finish and “hammered” green, blue and red (limited supplies of all “hammered” finishes!!!!). The Butterfly Benjolin comes in natural finish only. As of the summer of 2015, all the aluminum front panels of my Benjolins and Butterfly Benjolins are engraved and milled by CNC machine at the FabLab Berlin. Duelling Benjolins from macumbista on Vimeo. Two Benjolins cross-patched to modulate each other function identically to the Dual “Butterfly” Benjolin. A Static Environment for Complementary Instabilities from macumbista on Vimeo. 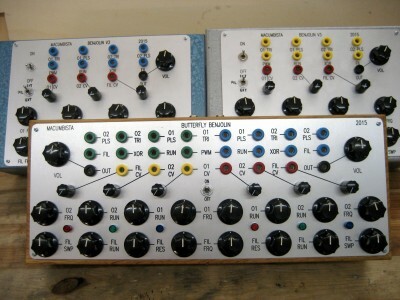 This long-take shows an example of symmetrical cross-patching between the two halves of the Butterfly Benjolin, and gives an idea of the self-modulation possible with this dual instrument. These 9 SoundBoxes are available as of 22DEC15. 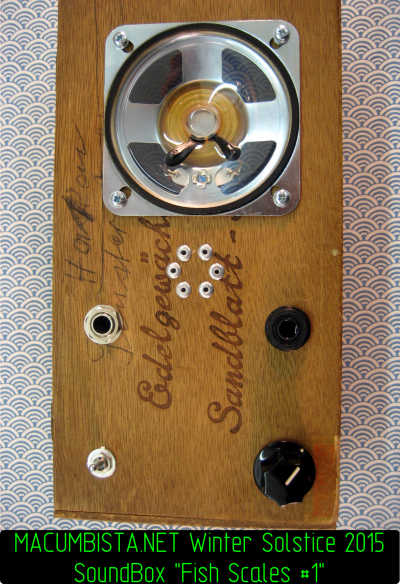 Each includes a resonant spring contact microphone. 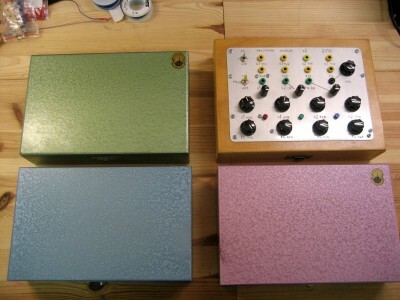 The boxes with transparent speakers are pictured with the Japanese paper used to line the inside of the box. The Type A SoundBoxes (92mm black speaker) can be purchased for EUR 83 (incl. 19% EU VAT) / EUR 70 (non-EU) plus postage costs. The Type B SoundBoxes (77mm backlit transparent speaker + Japanese paper lining) can be purchased for EUR 95 (incl. 19% EU VAT) / EUR 80 (non-EU) plus postage costs. Cash discount for Berlin-Lichtenberg pickup!!!! To order, please contact me by email: macumbista@gmail.com and include the name of the SoundBox you are interested in in the subject line. Solo performance for self-made analog synthesizer, analog vector video monitor and room by Derek Holzer. 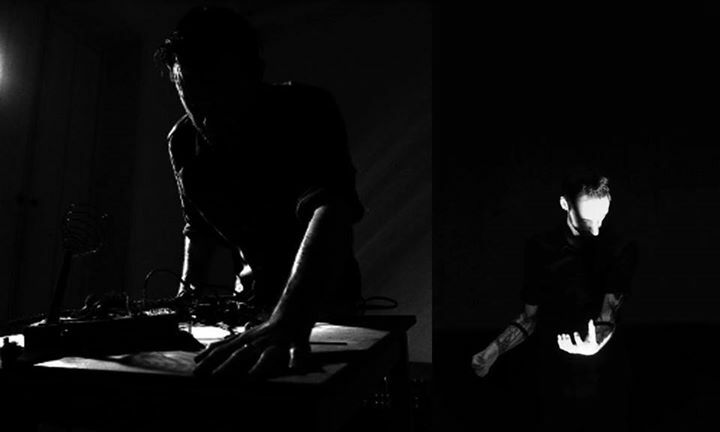 His live performances are largely improvisational journeys through different types of non-linear feedback processes, performed on a selection of self-made analog electronic synthesizers. He uses the unstable and chaotic patterns these machine create to explore the physical affects of volume, frequency and complexity within a given architectural space. 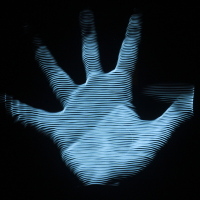 During this live performance at SPEKTRUM, he will introduce some of his recent experiments in vector-based audiovisual synthesis. For fans of Maryanne Amacher, Bernard Parmegiani, Eliane Radigue and Slayer. In this performance, Marco plays two pieces with the XTH Sense , a biowearable musical instrument he created 5 years ago. By performing whole-body, physical gestures, his body emits bioacoustic sounds which are amplified using wearable microphone sensors, interactively live sampled and diffused through loudspeakers and subwoofers. In this way, he creates music by literally composing the sounds emitted by the muscle tissue of his body in real time. The natural sound of the flesh and its virtual counterpart blend together into unstable sonic objects. This is what he termed Biophysical Music, music that is a joint result of physiological technology and markedly physical, visceral performance. 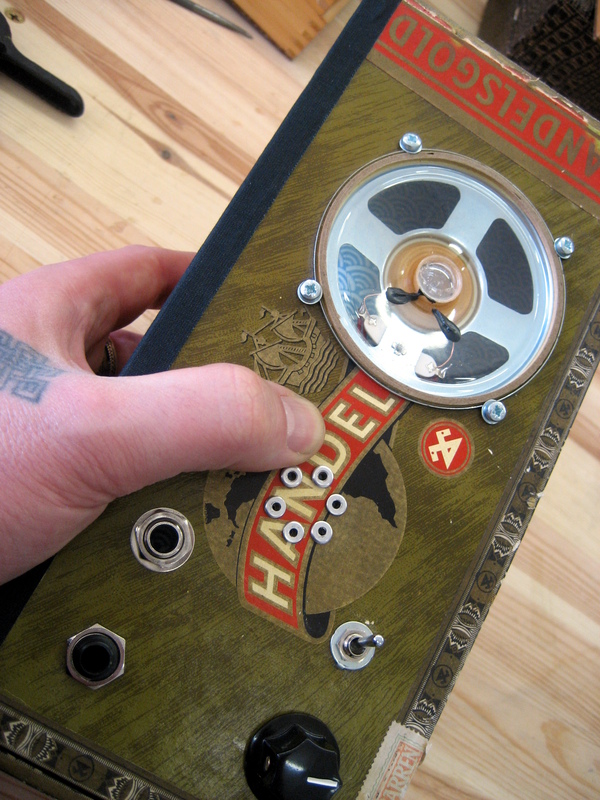 Derek Holzer (1972) is an American instrument builder and sound artist based in Berlin DE, whose current interests include DIY analog electronics, the relationship between sound + space, media archaeology and the meeting points of electroacoustic, noise, improv and extreme music. He has performed live, taught workshops and created scores of unique instruments and installations since 2002 across Europe, North and South America, and New Zealand. Italian born, living and working in Berlin, Marco Donnarumma is a performance artist, sound artist and writer. His work lies where performance art and sound art converge through technology. He has played interactive sound by amplifying sounds from his body, has induced visitors in altered states of self-perception by feeding sounds from their bodies back to their skulls and bones, has immersed audiences in multichannel sound and video produced by the strain of his muscles while he pulled 50Kg stones, and has physicalised digital viruses in the body. The focus of his practise is on how to configure human bodies and machines through sound. He uses biotechnologies, software algorithms and body sensors to create intensely physical actions, concerts and live installations which are renown for combining rigorous science, technical sophistication and critical thinking. 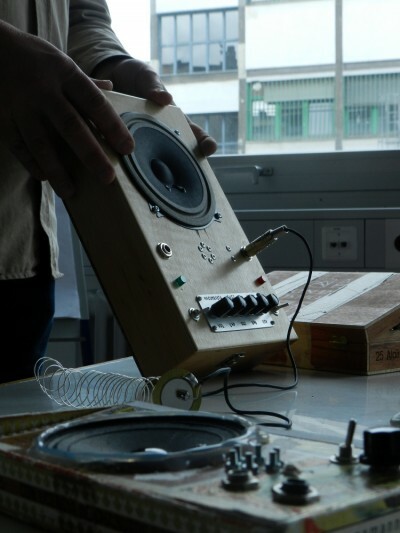 SoundBoxes Workshop + Performance Berlin JUL 2015 from macumbista on Vimeo. 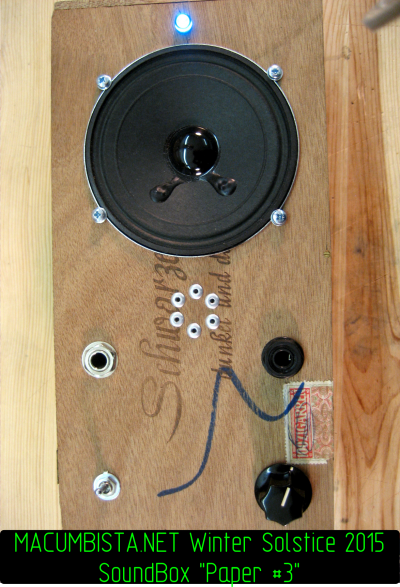 SoundBoxes are small, primitive electro-acoustic instruments built from a wooden box, a speaker, a small audio amplifier and a contact microphone. During the first of two workshop days, participants learned about electricity, how it becomes sound and then how to build their own personalized SoundBoxes. On the second day, they explored the possibilities of the SoundBoxes through a series of listening and improv exercises, with the goal of collaboratively creating the score for an immersive, surround-sound performance inspired by the works of Alvin Lucier, Pauline Oliveros, John Grzinich, David Tudor, Gordon Monahan and others, performed in a darkened room for an eyes-closed audience. In the piece, a swarm of individual, simple sound sources such as tones and textures are modulated and moved through the space physically by the performers to create a complex sonic environment. Delicate and intimate sounds pass closely near the bodies and ears of the audience, while stronger, more extreme sounds occur at the edges of the space to give a sense of the architecture of the room and the objects in it. Atelier Macumba presents the second public workshop in our Berlin-Lichtenberg studio with London circuit-bending master Tasos Stamou. 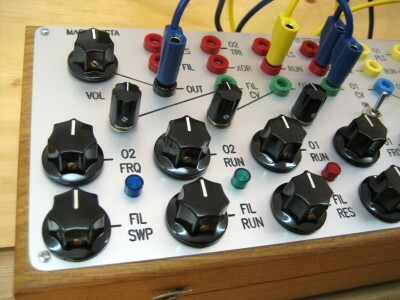 An introduction to hardware hacking which provides a practical and theoretical background in modifying and alternative electronic instrument design techniques using recycled electronics. 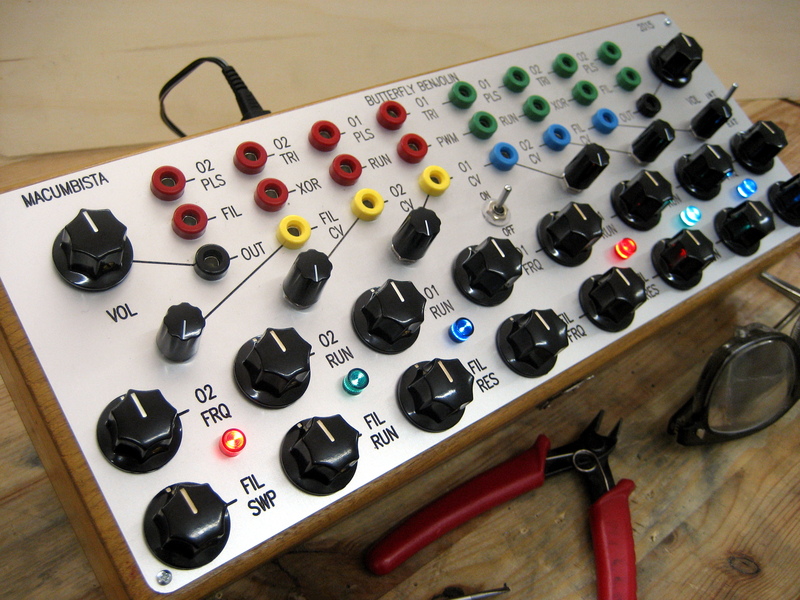 It is suitable for beginners, as well as to more experienced hackers and sound explorers who wish to push forward their ideas and projects of innovative sound interfaces. – Learn all the necessary techniques to turn ‘hackable’ electronic sound toys into useful sonic devices and experimental electronic music instruments. 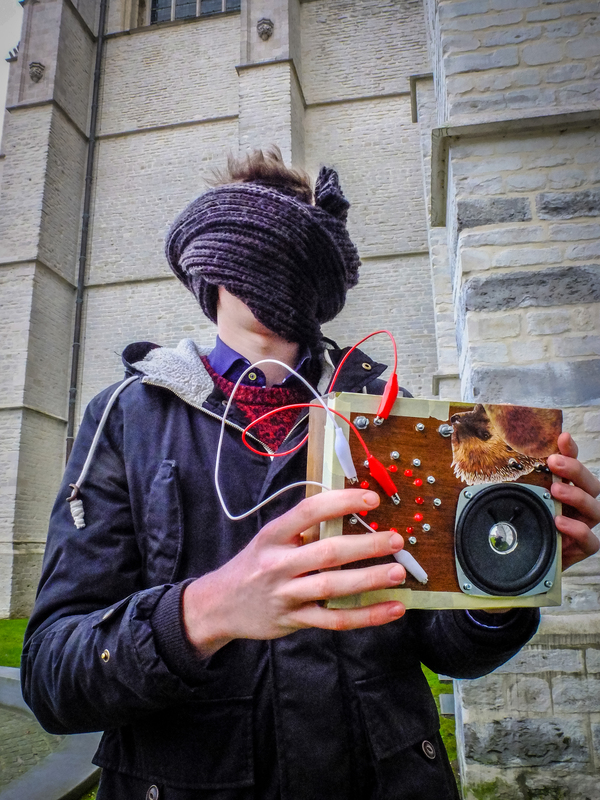 – Participants will design an experimental music instrument and take it home! 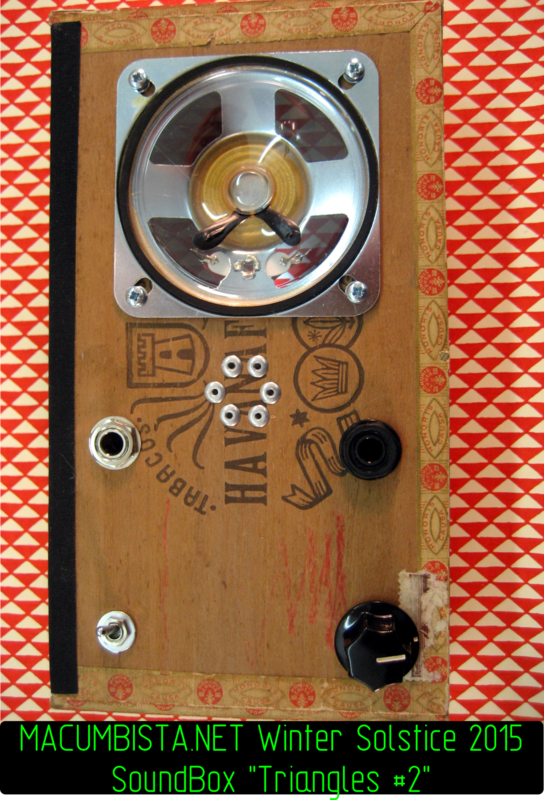 – Practical, hands-on workshop, including all tips to the most common and effective circuit bending modifications. – Theoretical introduction to handmade electronic instruments, including historical context and presentation of contemporary artists utilizing DIY electronics. 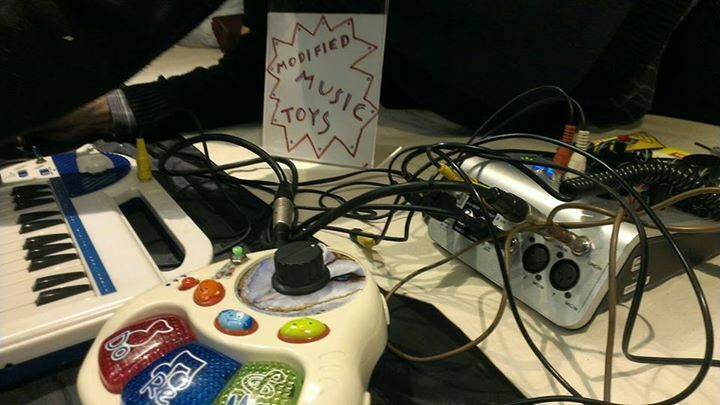 – Participants are welcome to bring their own electronic toys for hacking, otherwise “hackable” toys will be provided from a large selection. Please contact us with any questions regarding “hackability” of your own devices. 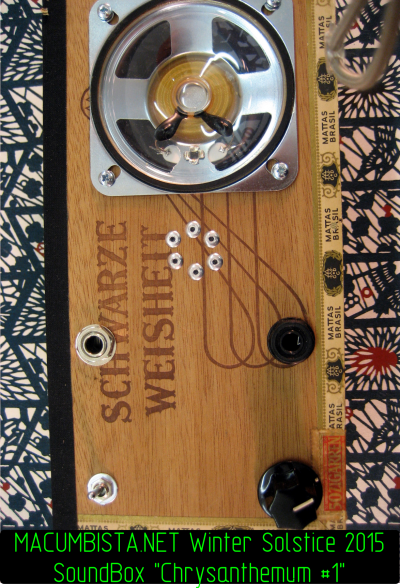 – Workshop participants will have the chance to perform with their own hacked instruments as members of an improvised circuit bending ensemble after the workshop completion. Participation in this workshop is by PRE-REGISTRATION ONLY to stamouinstruments@gmail.com. Location and further details will be provided upon registration. 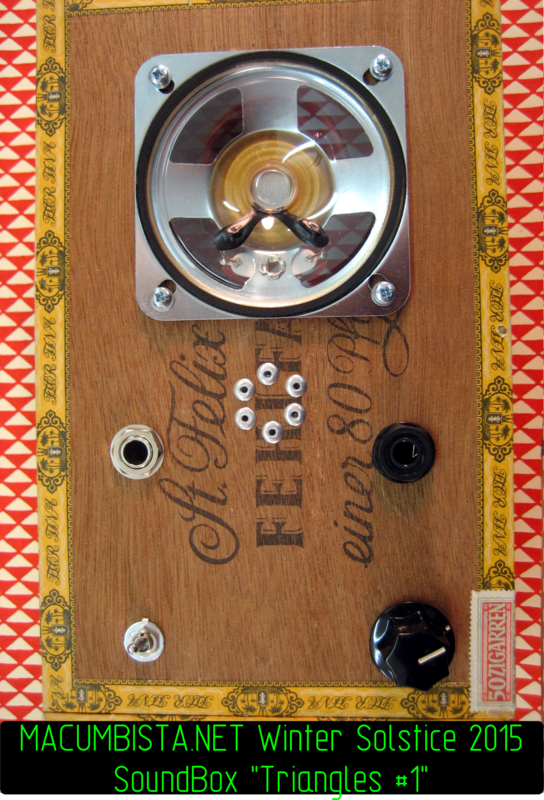 Tasos Stamou is a sound artist, a dedicated circuit bender and an instrument modifier/designer. He is an active member of music tech communities (Music Hackspace & Hackspace London, Hellenic Electroacoustic Music Composers Association). He has been utilizing his hacked creations into various performances (such as at the BENT Festival, New York) and recordings of obscure electronica ( Absurd, Triple Bathe, Orila, Lal Lal Lal, Kukuru Recordings). He has been leading hardware hacking workshops in festivals (Green Man Festival, SOTU Festival Lithuania, Athens Video Art Festival, NXNW Festival in Cologne, etc.) and music tech labs (Macumbista Studio in Berlin, Cafe Oto, Music Hackspace and Noise=Noise in London, STPLN in Sweden, WORM in Rotterdam, etc.). Broken Rope [Benjolin Vector Graphics test 3] from macumbista on Vimeo. From 5-15 OCT 2015, I will be Toolmaker in Residence at Signal Culture in Owego New York. While there, I intend develop a PCB which can be used for producing vector graphics, viewable via Vectrex, Wobbulator/hacked TV, laser display or other analog systems, which takes one or two audio inputs as well as control voltage. This board should include function generators, quadrature oscillators, phase shifters and multipliers, and could produce either traditional Lissajous figures using the analog multipliers or raster-type effects using synced function generators. The ultimate aim of the board is not only the development of artistic works, but also it’s use as the core of a future analog vector graphics workshop where participants both build and experiment with the circuit. The lo-res sketches included here were created in September 2015 in Berlin using a vector monitor [V INPUT, H INPUT, Z-AXIS INPUT, PULSE MARKER INPUT] + Dual “Butterfly” Benjolin. Benjolin Vector Graphics [test 1] from macumbista on Vimeo. Event Horizon [Benjolin Vector Graphics test 2] from macumbista on Vimeo. 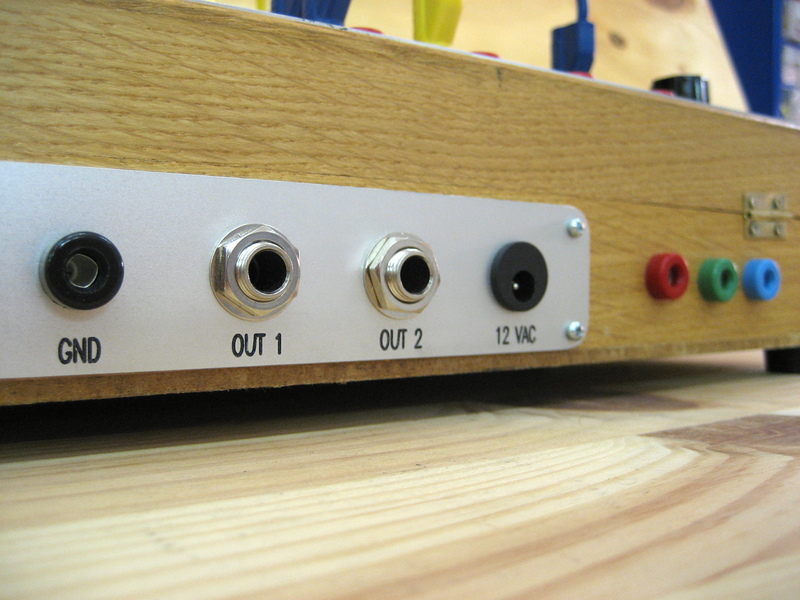 On this day we will briefly learn basics about electricity, how it becomes sound and then we will focus on how to build the Soundboxes themselves. In the final part of the workshop we will look at the possibilities of the Soundboxes through a series of listening and improv exercises. We will do this by jamming and improvising all together, working towards a collective performance of approximately 15-20 minutes in length. With all the experience gained during this day you will be the owner of your personal customized audio device – the soundbox – and taking home the experience to be able to make exciting sounds with it. This workshop is divided in two days. During the first day, we will learn about electricity, how it becomes sound and then how to build the Soundboxes themselves. On the second day, we will explore the possibilities of the Soundboxes through a series of listening and improv exercises, with the goal of collaboratively creating a score for a sound performance of approximately 15-20 minutes in length. This piece will be presented at the end of the second day. On September 3 the participants and the artist will discuss if the workshop can be extended both days with also the possibility to start earlier on September 4. This at the request of the artist to obtain a better end result desired for the participants. Derek Holzer will play his ‘Macumbista’ performance + participants Soundboxes Workshop 3 and 4 september will jam together. 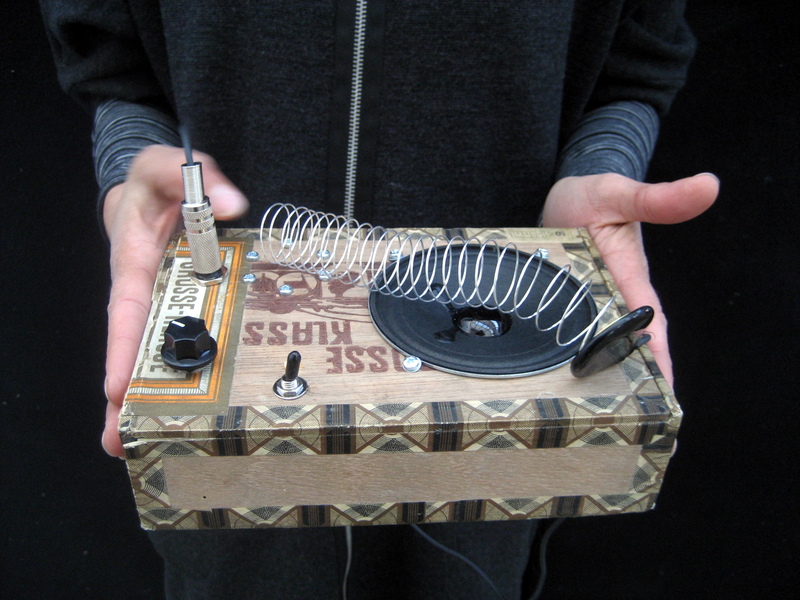 Discover the hidden sonic qualities of objects from our everyday world in this hands-on workshop, combining the arts of electronics, sound and performance. 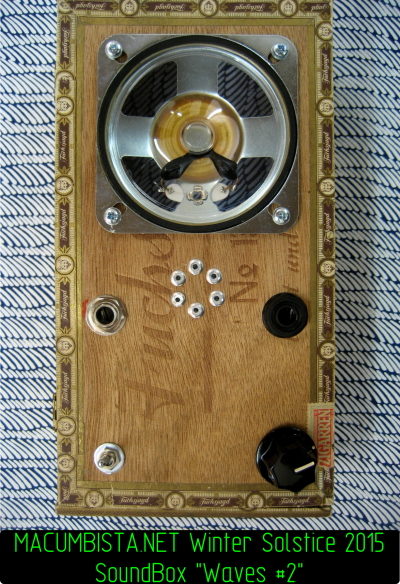 SoundBoxes are small, primitive electro-acoustic instruments built from a wooden box, a speaker, a small audio amplifier and a contact microphone. They can create a variety of drone and reverb-type sounds through feedback between the speaker and microphone, as seen in this video (https://vimeo.com/34477093). Or they can bring out the hidden sounds found within everyday objects as seen in this video (https://vimeo.com/16567547). They also have small touch points which can be used to produce a variety of ‘crackle box’ and ‘circuit bending’ sounds. * One loudspeaker (new, second-hand or salvaged), or one old electronic device containing a functioning loudspeaker of decent size (approx 90mm or larger) which we can remove. The size of this loudspeaker will determine the tone and loudness of your instrument – bigger is usually better. 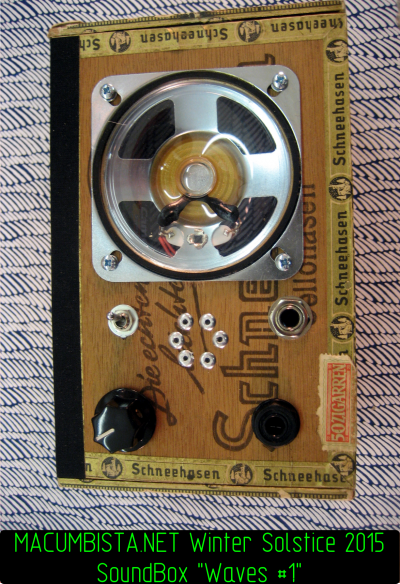 Look in old radios, electronic clocks, hi-fi systems, boomboxes or car audio systems for your own unique speaker! * A cigar box or similar wooden box to create the instrument. The box should be big enough to hold your speaker, and the lid must not be thicker than 5mm. Alternately, I will have cigar boxes and loudspeakers for sale if you cannot locate your own. Participants may also wish to bring their own found objects and images to create a unique audiovisual cabinet of curiosities. 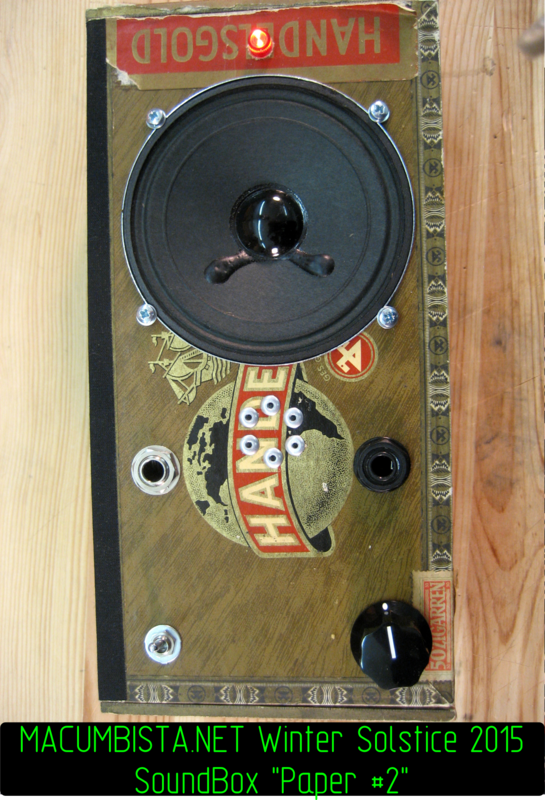 Some guitar effect pedals can also make the box more interesting. All other materials and tools will be provided. My autumn tour plans from the Low Lands to the Wild Wild West to the Great White North are 100% finalized! Hope to see some of y’alls in some of these here places…. I would also like to announce that Ruth Timmermans has taken up my booking activities as of AUG 2015. Please contact her at THECULTURALOPERATOR at_the_domain GMAIL dot COM for workshop, lecture and concert engagements. The participants in the SoundBoxes Workshop will present an immersive, surround-sound experience inspired by the works of Alvin Lucier, Pauline Oliveros, John Grzinich, David Tudor, Gordon Monahan and others, performed in a darkened room for an eyes-closed audience. In the piece, a swarm of individual, simple sound sources such as tones and textures are modulated and moved through the space physically by the performers to create a complex sonic environment. Delicate and intimate sounds pass closely near the bodies and ears of the audience, while stronger, more extreme sounds occur at the edges of the space to give a sense of the architecture of the room and the objects in it. PLEASE ARRIVE AT 18:00 SHARP FOR THIS PERFORMANCE! 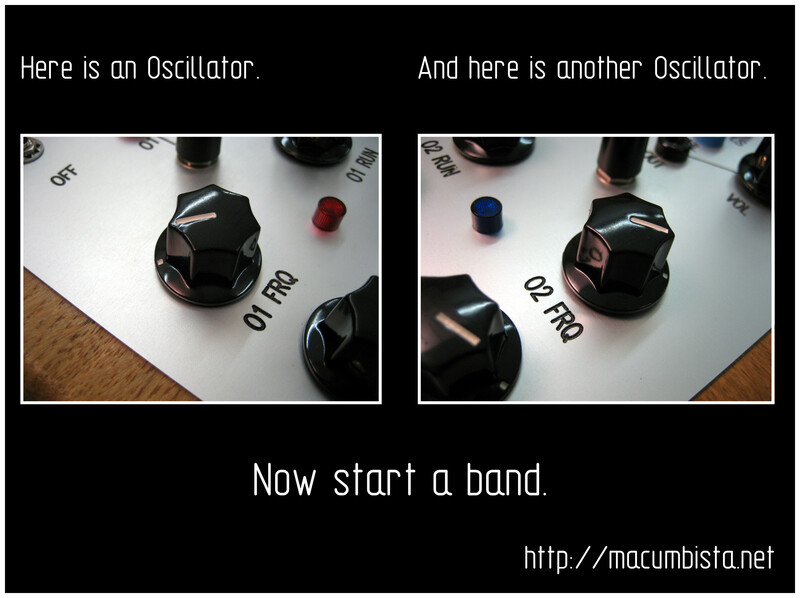 And then stick around for IPAs and a chance to demo some of the Macumbista sound instruments. 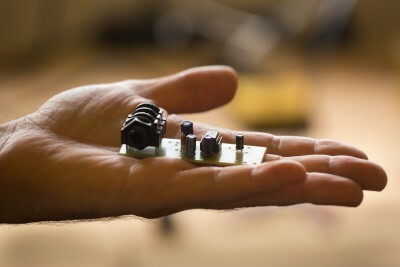 Discover the hidden sonic qualities of objects from our everyday world in this hands-on workshop, combining the arts of electronics, sound and performance. SoundBoxes are small, primitive electro-acoustic instruments built from a wooden box, a speaker, a small audio amplifier and a contact microphone. They can create a variety of drone and reverb-type sounds through feedback between the speaker and microphone, as seen in this video. Or they can bring out the hidden sounds found within everyday objects as seen in this video. They also have small touchpoints which can be used to produce a variety of “crackle box” and “circuit bending” sounds. This workshop has two parts. During the first day, we will learn about electricity, how it becomes sound and then how to build the SoundBoxes themselves. On the second day, we will explore the possibilities of the SoundBoxes through a series of listening and improv exercises, with the goal of collaboratively creating a score for a sound performance of approximately 15-20 minutes in length. This piece will be presented at the end of the second day. This workshop does not require any previous knowledge of electronics, only an interest and a curiosity in both sound and instrument-building. 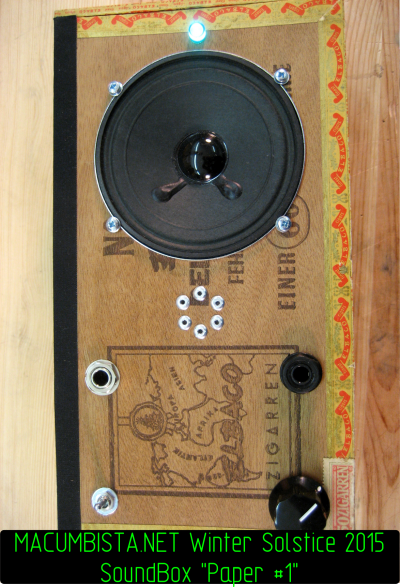 * 92mm loudspeaker (if needed): EUR 3. Pre-register for this workshop by sending an email with the subject “BERLIN SOUNDBOX WORKSHOP” to MACUMBISTA at the domain GMAIL dot COM. 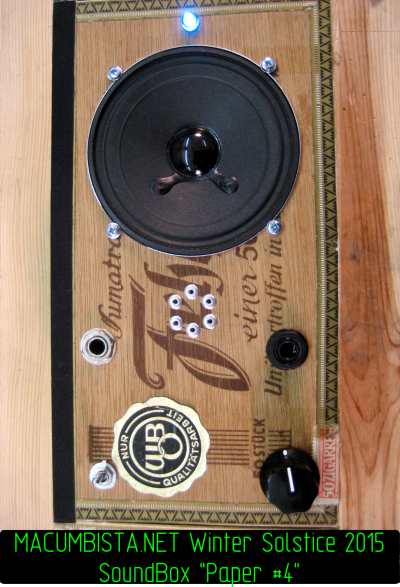 Please indicate whether you would like to build the Basic SoundBox or the FuzzTone SoundBox. Powered by WordPress v 5.0.2. Page in 0.680 seconds.